The diner is clean and you can seat yourself. Friendly staff of people and the food is very good.I look forward to coming back. What can I say? It's the Honey Bee. I have always loved this place. A whole lot of delicious home cooked food for a fantastic price. The waitresses are awesome too! Great breakfast, great service and the super fast friendly staff made my breakfast a very nice experience. Consistently good food, good service, good prices. Authentic Diner! The food was delicious and quickly prepared. Could have been cleaner but the food is great! The turkey club was excellent. Service was excellent! Food was prepared to perfection. In typical diner fashion, they offer a 10+ page menu. Some of their specialties are biscuits & gravy, french toast, and grits to name a few. food was average, service was... interesting. Good food, great prices and nice people. Comfort food st great price! Yummy breakfast options and the home fries are very good with lunch or dinner. I love coming here. The food is always amazing and the service and people are so wonderful!! Their link sausages are the best. My food was yummy & our waitress was great. The food arrived timely & refills was in point. Awesome as it always was been forever. The food is always hot and good. Everyone is always friendly nice. 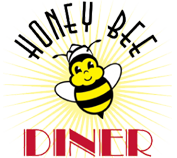 I Absolutely Love the Honey Bee Diner. The staff is very friendly and they actually remember their customers. The food is very good and plentiful. It's a small diner but the ambiance, staff & great food more than make up for space. Excellent food, great service, busy place. My only complaints are that their portions are HUGE (hahahaha) and that I hadn't found it sooner. Quick homecooked for carryout and eat in is t a bad wait at all. Love it more late night. It was great,the staff was nice and food was good. Great service and food! It looked so good I forgot to take a picture of my entree but the side salad I started with was beautiful. Excellent Service and good food!!!! Food was dry and had no flavor. Great staff and service, food was delicious and filling. Fast and good old fashioned diner. Love this place. Good service and great food!! Great food. Huge portions. Prices right. It's where the locals go! Good home style cooking! !